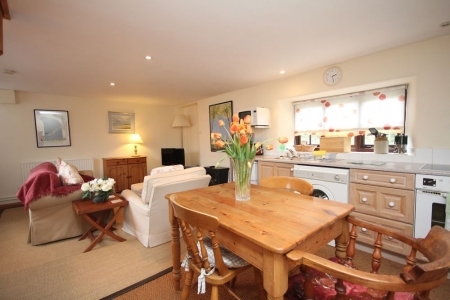 A romantic self catering one bedroom vacation rental cottage in the Quantocks. The Mouse House is a perfect nest from which to explore the beauty of the Quantock hills and the local attractions. This one bedroom self catering cottage has a spacious open plan upstairs double bedroom (shown left) and large dressing area.The bathroom has a bath and full electric shower. 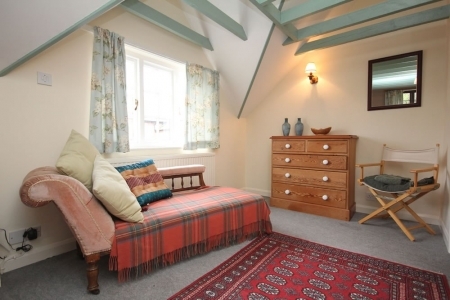 It\'s very spacious for 2 people And could easily accommodate a baby and cot. Downstairs, this romantic cottage has an open plan lounge and kitchen area. The lounge has TV with Freeview, and DVD player which also plays CDs, The cottage\'s kitchen is locally made and of fitted Beech and has a washing machine and microwave. Because the Mouse House is fully centrally heated, it makes a cosy and warm all year round cottage. Electricity is pre-paid by card meter. This does not effect hot water and central heating which are included in the rental. The average usage is £5.00 per week. The Mouse House cottage has access to the shared swimming pool and tennis court. Basic rackets are provided! For the more adventurous you can explore the Quantock hills by foot, bike, car or horse. Or simply site yourself for a culinary journey in one of the many local fine restaurants and pubs. Arrival times are after 3pm and departure times on or before 10am.